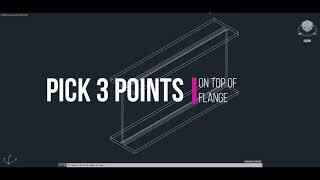 If you create 3D Structural Steel Shapes as 3D Solids in Autodesk® AutoCAD® then you can easily add coping to the 3D steel shape using this App. All you have to do is select the shape, then pick 3 points along the top of the steel flange then pick the depth for the cope. The cope is then applied to the 3D Steel Shape.